Apparently plans are underway to construct high-speed rail (HSR) between Atlanta and Charlotte. Though HSR between the two cities is only in the initial planning phases, a huge decision needs to be made regarding the potential route. 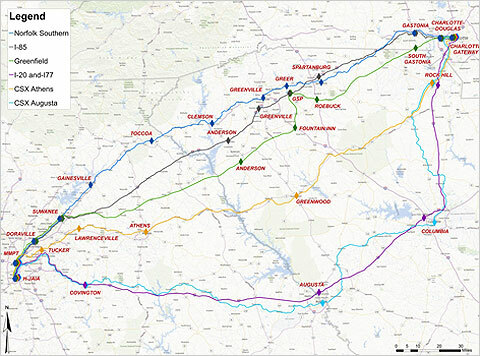 The Georgia Department of Transportation (GDOT) is leading the project on behalf of the Federal Railroad Administration and they have identified six proposed routes for the rail line. Those clamoring for a rail link between Atlanta and Athens will be pleased to notice that Athens is a stop on one of the proposed routes. Obviously those planning the route have to take a number of factors into consideration, but let’s take a look at the routes based solely on the proposed cities to be served and the purpose of HSR. The link between Atlanta and Charlotte will be an extension of the Southeast High Speed Rail Corridor (SEHSR), a plan developed through the cooperation of state legislatures and the business community. The plan is being implemented in piecemeal fashion with each state working on segments of the line – GDOT is responsible for the line between Atlanta and Charlotte, NCDOT is responsible for the line between Charlotte and Richmond, and VDOT is responsible for the remaining portion between Richmond and Washington. Overall, this is part of a larger high-speed rail corridor identified by the USDOT in the 1990s that would provide service from the northeast down to Florida. Is the initial purpose behind this HSR line to create a quick link between Atlanta and Charlotte or to connect a series of cities with the two end points being the two largest cities in the region? The answer should guide the route. If the purpose is to create an alternative mode of transportation between the two major cities, then speed is a critical factor. If the purpose is to connect a series of medium-sized cities to the larger cities of the region then speed is much less critical. Because the project is part of a larger plan to quickly connect major cities in the southeast with those in the northeast, it seems like the purpose should be to avoid connecting a series of smaller cities in order to maximize speed. This would help make SEHSR an adequate alternative to air and highway travel. GDOT has identified six potential routes between Atlanta and Charlotte. The first route involves upgrading the line already being used by Amtrak, which runs through Spartanburg, Greenville, and Gainesville. This route serves a number of mid-sized regional cities and is a fairly direct route between Atlanta and Charlotte. The next five routes all swing south and connect cities that are not already served by passenger rail. These routes are preferable for two main reasons: they don’t serve many cities and the cities they do serve would be new to passenger rail service. The purpose of SEHSR is to provide high speed rail service between major cities, so the routes that have fewer stops are able to provide the quickest service. In looking at the latter 5 routes, the number of cities and quality of the cities must be balanced with distance. The result suggests that routes 4, 5, and 6 are most desirable. The first route, upgrading existing rail service, is less desirable because the number of cities on the route would result in slow travel speeds making rail a less viable alternative to air or auto. This route could presumably still be operated by Amtrak to connect those cities, but the purpose of the route would not be to quickly connect Atlanta and Charlotte. Routes two and three take similar routes as route one, but serve fewer cities. However, the cities served on those routes are not as significant as the cities served in routes 4, 5, and 6. Route 4 achieves a passenger rail link between Athens and Atlanta – something many people have wanted for a long time. It also serves significantly fewer cities than route 1. Routes 5 and 6 swing south and serve both Augusta and Columbia. Though these two routes involve greater distance than route 4 (315 miles vs. 275 miles), they serve many more people (Augusta and Columbia together have a population of 330,000 compared to 116,000 for Athens) and achieve a link between the region’s state capitals. Though passenger rail service between Athens and Atlanta would be great, the best option for a project designed to quickly connect major cities in the southeast is likely a route going through Augusta and Columbia.